When the Team Card Packs first went on sale, I had two immediate thoughts. My first thought was to be a little concerned by the idea of team specific Special Play cards that might give one team an advantage over others. As it turns out, that concern was unnecessary as there are actually only a few Special Play cards in the deck, and those cards are not team specific. The Special Play cards are simply standard Random Events and Miscellaneous Mayhem cards. The second thing I noticed was that the Team Card Packs were a bit more expensive than previous decks. I was really curious why the new card decks had a $10 (US) price hike. Once I got the decks in hand, I understood the higher price of $25 per pack. As you can see, the Team Card Packs are much larger than previous decks. 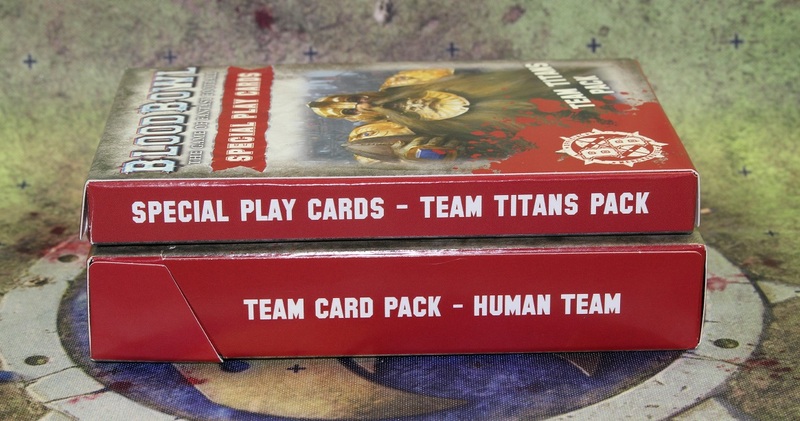 The Team Titans Pack included 26 cards, while the Team Card Packs contain 44 cards each. Let’s take a closer look at the different decks. First up is the Elven Union Team Card Pack. The Orc Team Card Pack pretty similar to the Elven Union deck, but there are a few simple differences to account for the differences in roster options for the team. Again, there are six different card types in the deck, but where the Elven Union team, and therefore it’s team player cards only have four different positions, the Orc team has six different positions. 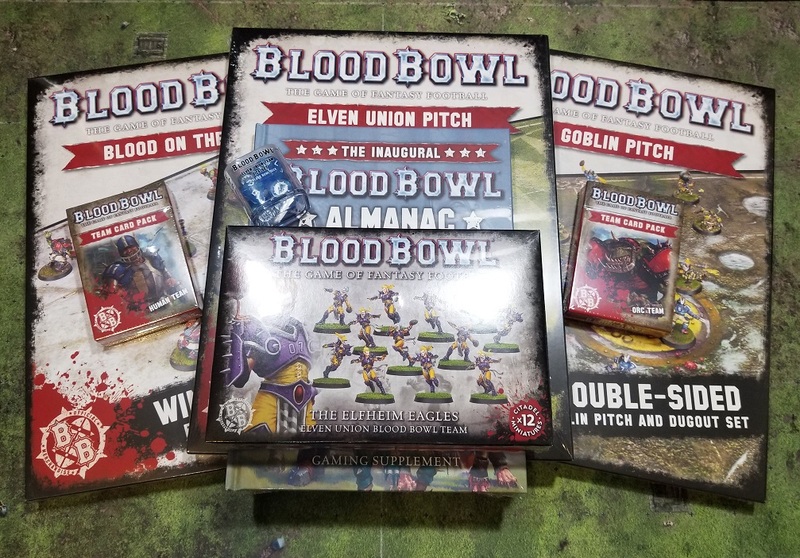 This is actually increased from the boxed set where the cards only included Linemen, Throwers, Blitzers, and Block Orcs. In the new Team Card Pack, we finally get cards for the Goblins and Troll that are on the Orc team roster. Due to the increased number positions on the Orc roster, and as a result, the increased number of both pre-printed and blank player cards (you get a few extra for each position) in the deck, there are only half the number of Special Play cards in the Orc Team Card Pack. The Star Player cards in the pack include Scrappa Sorehead, Ripper Bolgrot, and The Black Gobbo. Like the Elven Union pack, the Orc pack also includes the Match Record and Ref cards. 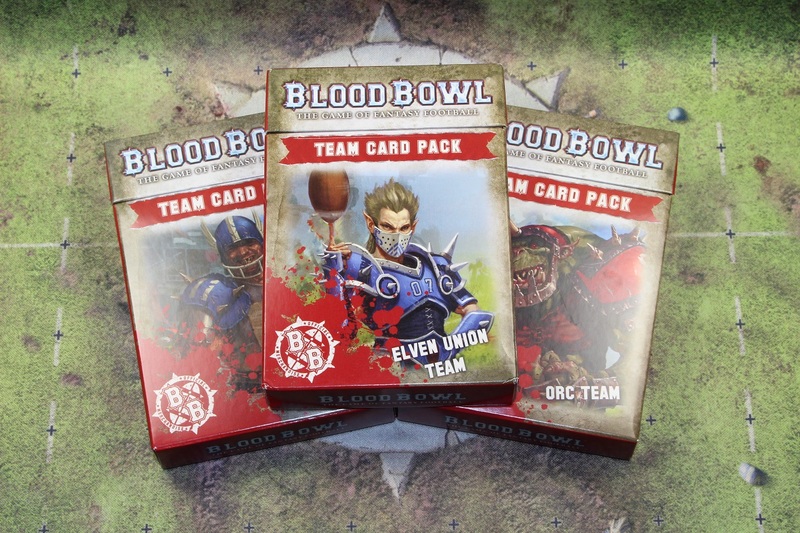 The Human Team Card Pack rides a middle ground between the Elven Union and Orc Team Card Packs. The Human team has five rostered positions compared to the Elven Union’s four positions and the Orc’s six positions, and that is reflected in the number of player cards in the pack. There are eight Special Play cards, again equally divided between Random Events and Miscellaneous Mayhem. The Star Player cards included in the deck are for Morg ‘N’ Thorg, Helmut Wulf, and Karla Von Kill. Obviously, as far as Special Play cards go, the new content in the Team Card Packs is a little on the light side. I think the main thing that I took away from the new packs is that Games Workshop is really pushing cards for their games these days. Every current Games Workshop game box I look at on the shelves of my local game store seem to contain a lot of cards. There are also a number of expansion decks sitting on the shelf next to those game boxes. For Blood Bowl, I like the idea of quick reference player cards to help new coaches that are still learning the game, but I don’t think I will ever replace my trusty Excel spreadsheet rosters with these blank team player cards. The player cards themselves for the Human and Orc packs use the same pictures as the ones that come in the boxed set, but they also include roster building information not included on the original cards. For me, I think the Star Player cards might get a bit more use for inducement purposes. The Ref “red card” might be fun to shove in my opponents face if one of his players gets ejected for Fouling… cause, you know, that’s how I roll. I like the new decks, but their value to you may be based more on whether you intend to use the blank player cards to keep track of your team or not. There are only a few Special Play cards, so the increased cost might not be worth it if those cards are all you’re looking for. Let me know you think of the new Team Card Packs in the comments! This entry was posted in Blood Bowl, Gaming, New Releases and tagged Blood Bowl, Elven Union Team Card Pack, Games Workshop, gaming, Human Team Card Pack, Orc Team Card Pack, Special Play Cards, Star Players, table-top games, tabletop wargames, Team Card Pack, wargames, Wargaming by Mike C. Bookmark the permalink. My order for the Elven Union team pack is held up (stagecoach robbers?! ), so I’m glad to see your post on the team packs! I didn’t expect 44 cards, so that is nice. I’m with you, on keeping track of teams in excel. Until there is a really nice, intuitive application that lets me keep track of all the data I want, excel it is. I do like the idea of the Star Player cards and those have always been handy. Doubt I would use the blank player cards. The positional cards are really nice for beginners, especially since there is a picture of each model type. I think that would be pretty helpful for new people entering the game. Those, the Star Player cards, and more Special Play cards sell me on picking up the Orc and Human packs. I think I would have preferred the Special Play cards to be in a separate pack, and maybe the Star Players as well. I’m not sure how much use, if any, that the player cards will get. That’s a good point, especially since they are not team specific Special Play cards. But that’s a good thing. Not sure I see much value in the team packs. It’s a bit frustrating that if I want to get more special play cards I need to purchase a team pack that has a lot of cards I would never use. Is there a specific use for the halfling ref card? Negative, Ghostrider. It’s basically just the back side of the instruction card. I was thinking maybe you could use it as an automatic ref call on a foul, but with instructions on the back it seems that idea is doomed.